LONDON (AP) Not for the first time at Wimbledon, Dominika Cibulkova was left agitated by a decision that went against her. Two points from the first set at 4-5, 0-30 on Hsieh’s serve, Cibulkova was awarded a set point, before having it taken away from her after a seven-minute delay involving discussions between both players, the chair umpire, and the match referee. 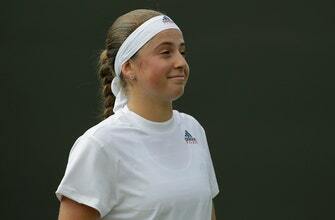 The Slovakian’s patience was tested again when a backhand she struck onto the baseline was called out. Hsieh, who defeated top-seeded Simona Halep in the previous round, returned the ball over the net and into the court as Cibulkova immediately challenged. Hsieh of Taiwan protested to the Chinese umpire in a language that Cibulkova couldn’t understand before the match referee became involved as calls of ”replay the point” came from a bemused crowd on Court 18.